Horse hooves require tremendous amount of nutrition including protein, sugars, vitamins and minerals. Minerals such as straight sulphur, selenium, and silica are significant in overall hoof health. Silica promotes bone health, strengthens collagen and hardens the hoof wall, while selenium and sulphur contribute to collagen production and strengthen the cross link bonds in the keratin. Sulphur is a critical nutrient for strengthening the amino acids (protein units) that serve as major building blocks in healthy collagen to form a strong hoof wall. Obvious signs of sulphur deficiency include poor hoof growth, dry and cracking hooves, poor hair coat, skin conditions and allergies. Sulphur can be supplemented as methionine or as Horsetail herb. A selenium deficiency in the hoof can appear as horizontal cracks near the top of the hoof below the coronet band, a yellowing frog and/or lameness due to either weak hoof structure or strained ligaments and tendons. Selenium can be supplemented in either an inorganic form (known as sodium selenite, which is actually a by-product of copper mining) or in an organic form. Sodium selenite is the most common supplement available but is also the toxic form of selenium which is why it cannot be given in extreme doses. Silica is not only critical for the early stages of bone formation but also plays a major role in the formation of the collagen matrix of bone and cartilage. Normally horses obtain small amounts of silica from grass and hay as all plants use silica to provide rigidity and structure to their leaves and stems. Deficiency symptoms of silica include weak and brittle hooves, sand cracks, abscesses, lameness, inflammation of tendons, and bone weakness with loss of density. Nutrient Sources Some of the best plant sources for silica and sulphur supplementation is horsetail and oatstraw. Horsetail has a number of other benefits: strengthens the respiratory system, improves skin and hair coat, aids urinary function and increases calcium absorption. Poor hoof circulation is always a factor in unhealthy hooves since improper hoof mechanism constricts blood supply and therefore the delivery of oxygen and nutrients. Horse hooves are very much a reflection of the whole and the treatment of the hoof should always consider the whole health of the horse. Conversely, treating the whole health of the horse will always benefit the hoof. Last week, we discussed some of the amazing benefits of Chia Plant. We continue and complete the series today in Part 2. Read on and let me know your experiences too. This Wednesday, February 26th 2014, don’t miss the online radio show, Healing Horses Naturally by Marijke van de Water. Learn how to heal common horse health conditions with diet, nutrition, natural remedies and supplements. 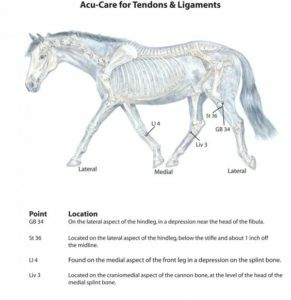 Colic, bloating, gas, injuries, infections, colds, flus, arthritis, skin conditions, allergies, hormonal imbalances, liver conditions and a variety of other ailments that horses are prone to. Marijke van de Water, B.Sc., DHMS Marijke is a Health & Nutrition Specialist, Homeopathic Practitioner, a gifted Medical Intuitive and Healer, Author & Educator. She considers food, natural medicine and energy healing as “mainstream”. Marijke has over two decades of clinical experience in private practice helping people and animals regain optimum health. She has guided thousands of success cases.